According to the CWGC list there is also 11 CWGC WWII graves. As this cemetery is about 2 mins from my house, I hope to go up later today or tomorrow and do some searching! I have now taken photos and notes on all the WWI and WWII and other Military graves within the cemetery (that I could find!) There might be some that I have missed, but there was a few hiding behind very large bushes, that were impossible to remove to read the inscription and there was also one or two which appeared to have toppled over on to their face or the face was missing due to the weather over the years. Although I was impressed by the high standard of maintainance within the cemetery, I was saddened by the number of stones which had fallen or been ,for safety reasons propped up against the foot of the stone. Up untill the 1950's there was some German war dead buried within this cemetery but they were exhumed and reburied in a cemetery in England. I will post photos once photobucket allows me to download some more onto the site! SNWM entry: can’t find one. 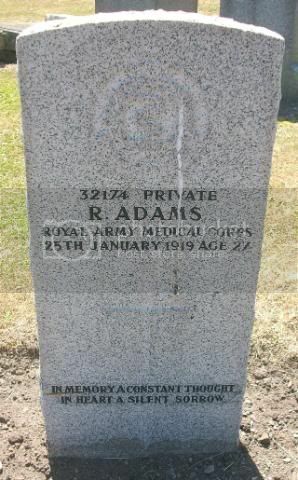 CWGC stone: 32174 Private R Adams Royal Army Medical Corps 25th Jan 1919 age 27. Memorial: Marham (Holy Trinity) Churchyard. UK. Awards: Son of Robert and Agnes Baxter of Niddrie. Returned from Argentina to serve. SNWM entry: Had him attached to the 16th Bn. 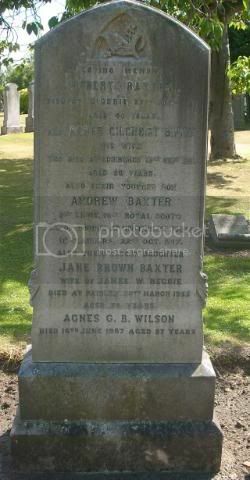 Family grave: In loving memory of Robert Baxter died at Niddrie 27th Jan 1891 aged 43 years and Agnes Gilchrist Binnie his wife who died at Edinburgh 18th Sept 1911 aged 56 years and their younger son Andrew Baxter 2nd Lieutenant 16th Royal Scots died of wounds at Houthulst Forest in Flanders 22nd Oct 1917, also their eldest daughter Jane Brown Baxter wife of James W Begbie died at Paisley 28th march 1955 aged 76 years, Agnes G B Wilson died 16th June 1967 aged 87 years. 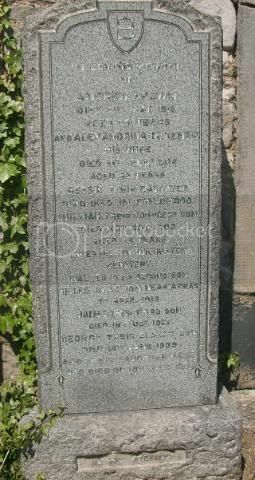 Additional Info: Son of Andrew and Elizabeth Beveridge of 58 High Street, Portobello, Edinburgh. Memorial: Tincourt New British Cemetery, France. SNWM entry: no new info. 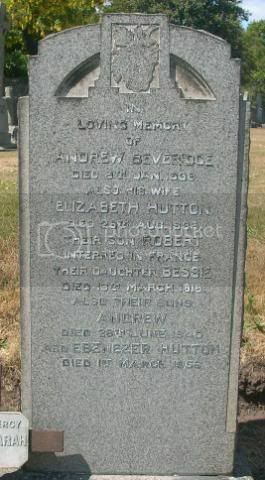 Family grave: In loving memory of Andrew Beveridge died 9th Jan 1938 also his wife Elizabeth Hutton died 28th August 1938, their son Robert, interred in France, their daughter Bessie died 16th March 1918, also their sons Andrew died 26th June 1940 and Ebenezer Hutton died 1st March 1956. Additional Info: Son of John Birse, husband of Bella Birse of 355 Leith Walk, Leith Edinburgh. Memorial: Coxyde Military Cemetery, Belgium. 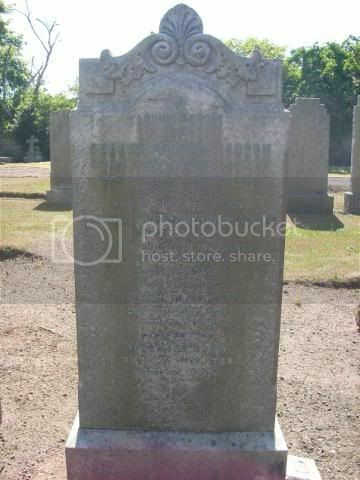 Family grave: In loving memory of Georgina Gordon beloved wife of Alexander Murray died 13th Dec 1933. Pte Alexander Birse beloved husband of Bella Murray killed in action 1st Sept 1917 and the above Alexander Murray died 5th Dec 1950. Family grave: In loving memory of George Arthur Gordon son of Ralph Blackett who died 5th Jan 1915 aged 29 years and of our eldest son Corporal Fred Mowbray Blackett 9th Royal Scots killed in action in France 29th Oct 1916 aged 36 years, also the above Ralph Blackett died 27th June 1924 aged 72 years and his wife Mary Mowbray died 24th June 1929 aged 72 years. 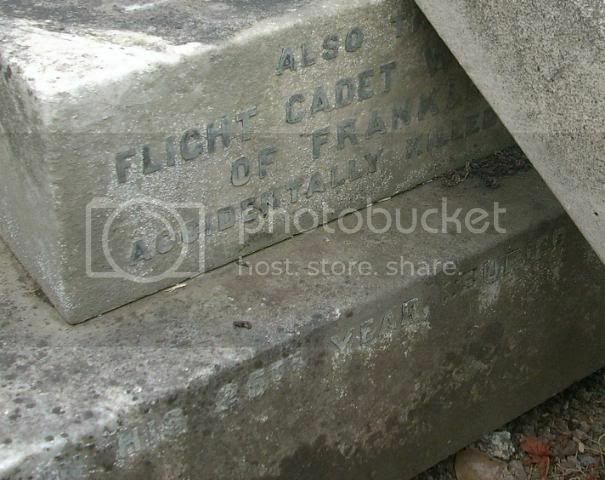 Family grave: Treasured memories of Pte Francis Henry Bosher killed in action in Mesopotamia Dec 15th 1916 aged 36 years and his only son Robert Francis Bosher late Edinburgh City police died June 18th 1932 aged 27 years. SNWM entry: 34832, born in Portobello. 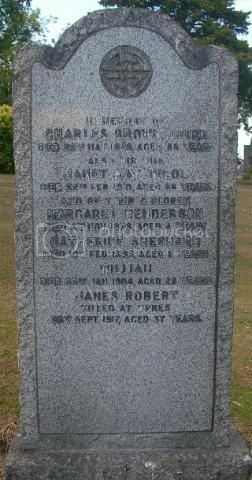 Family grave: In memory of Charles Brown, joiner died 22nd May 1929 aged 86 years also his wife Janet Kay Nicol died 22nd Feb 1910 aged 66 years and of their children Margaret Henderson died 4th Nov 1878 aged 8 years, William died 23rd Jan 1904 aged 28 years, James Robert killed at Ypres 26th Sept 1917 aged 37 years. 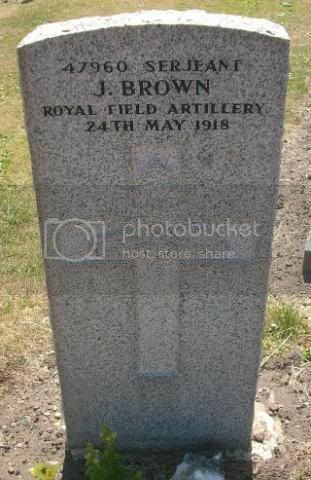 CWGC stone: 47960 Serjeant J Brown Royal Field Artillery 24th May 1918. Memorial: Blenvillers Military Cemetery, France. Family grave: In loving memory of Andrew Brown died 31st May 1918 aged 75 years and Alexandrina McKenzie his wife died 16th Feb 1902 aged 52 years. 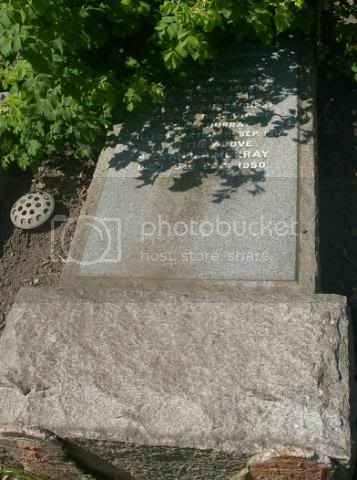 Bessie their daughter who died in childhood, William their youngest son died 20th Oct 1980 aged 19 years, interred at Warriston Cemetery. Walter their 2nd son killed in action near Arras 7th April 1918, James their 3rd son died 19th Oct 1933, George their eldest son died 10th June 1939 and their daughter Kate who died on 19th June 1957. Additional Info: Son of Samuel Milne Buchan and Rose Augusta Buchan of Portobello. Memorial: Abbeville Communal Cemetery, France. Family grave: In loving memory of “Little Muriel” beloved daughter of Samuel and Rose Buchan born 22nd August 1891 died 11 April 1893, also Leslie Alexander Lieut. 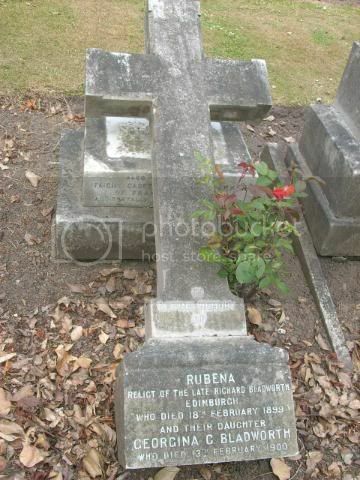 Royal Field Artillery beloved elder son who died on 30th July 1916 (of wounds received in action in the Somme) and was interred at Abbeville France and the above Samuel Milne Buchan dearly loved husband of Rose Augusta Buchan born 20th May 1861 died 22nd august 1941. SNWM entry: Burns, John Carmichael. Born in Portobello. Died at home. 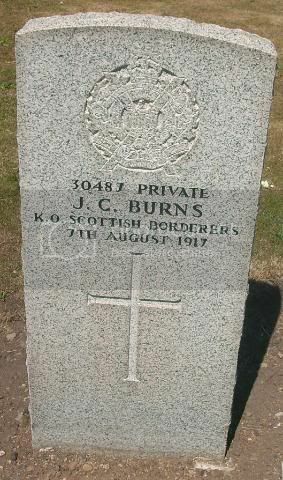 CWGC stone: 30487 Private J C Burns, Kings Own Scottish Borderers, 7th April 1917.